There is nothing greener than restoring and reusing what already exists. The reuse of materials keeps them out of the land fill, and minimizes the need for energy to be wasted on the production of new materials. It has been estimated that as much as 40% of our landfill waste is from construction. Most older homes are built with superior materials, such as old growth wood. Old growth wood comes from trees that grew and matured naturally over centuries. This allowed the wood to harden and become more insect and moisture resistant, as opposed to new growth wood. New growth wood is typically a fast-growing species that is not given the same opportunity to mature, and results in a weaker building material. By reusing old growth wood materials that are often found in older homes, we not only retain better-quality materials, but we minimize waste in our landfills, and lessen our carbon emissions from cutting and treating new growth wood for building use. The Heritage Home Program encourages homeowners to maintain building materials like old growth wood because it is both beneficial for the environment and an integral part of the original architecture of a home. 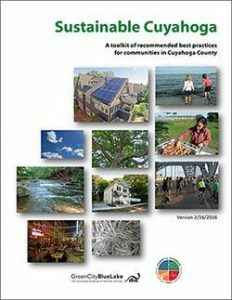 In March of 2016, Cuyahoga County released a toolkit for a “Sustainable Cuyahoga.” The toolkit includes an section on “Green Building and Historic Preservation.” Preservation and adaptive reuse of older buildings is cited as being one of the best methods for a sustainable community, and the Cleveland Restoration Society is mentioned as a community leader and educator in historic preservation practices. 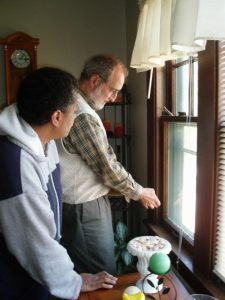 By offering the Heritage Home Program to your residents, you are already employing one of the tools recommended in the kit. The toolkit was generated by Cuyahoga County and the GreenCityBlue Lake Institute. It compiles a series of best practices and “how-to’s” for municipalities to learn from and implement. You can access the toolkit here. “Green Building and Historic Preservation” information can be found on page 15 of the toolkit.